This page is where I'm posting random analog projects for the time being. Props, puppets, and other junk experiments. Made these goggles out of welding goggle and old broken radio parts. Has a working light with a switch connected to a battery pack in the headband. Check the video. Cardboard puppet made to be a prop in live shows with my rap group Blood Punch. Here is a video of me testing it. And a video of the simple elastic mechanism. Worked with kids at the Renzi center to make the Summit of Sound. A short Hip Hopera about friendship and music. 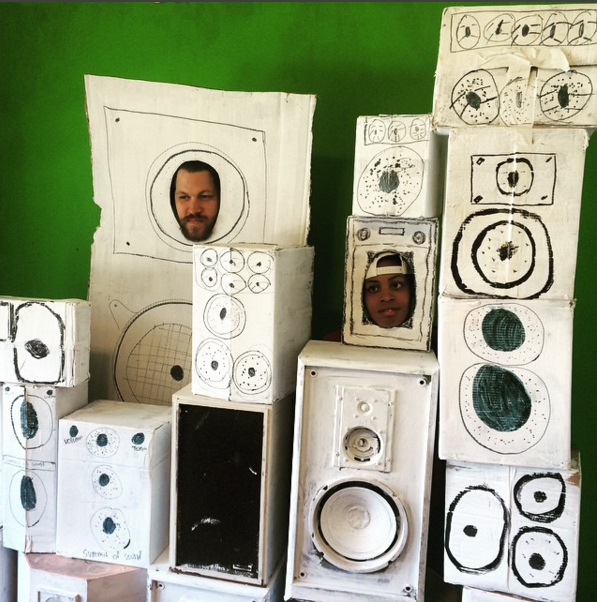 I helped the kids write and record songs and build a wall of speakers and other props. They come up with the story line and script. Jon Mackey directed and edited. Watch the full video here! Probably the nerdiest stuff I make is terrain for dungeons and dragons games. I cut them out of foam and paint them for the rare occasion my d&d group can get together.